APGS 2019 - A New Mindset For Golf In Asia! APGS 2019 - A New Mindset For Golf In Asia! APGS 2019 – A New Mindset For Golf In Asia! Wonder how many in Asia have ever thought about who or what oversees the game of golf in Asia and who is or what is directing the growth of the game on this giant Continent? The odds are that very few have even thought about this and even if we have had a moment to consider it, it’s not a matter that would have occupied any position of importance or urgency. Asia as a marketplace for golf is too important to just sweep under the rug. The time has come for the golf industry in Asia, which incidentally is reported to have more than 14% of the world’s golf courses to take the industry seriously. It ranks third after North America and Europe, and with this sort of critical mass in place, it’s time to start taking matters in its own hands. The industry is large and it’s growing in Asia and we need conscientious decision makers from the region to be responsible for charting and growing the game instead of adopting oftentimes failed cookie-cutter templates from other regions of the world where golf has been known to be in a retardant state. This will serve as a backdrop for the 2019 Asia Pacific Golf Summit (APGS), the 13th edition. 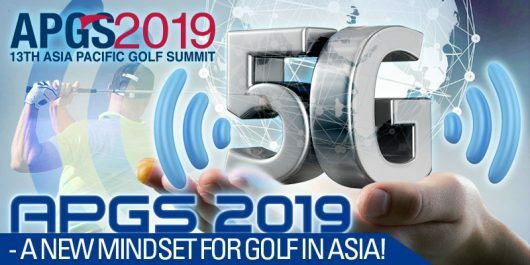 It is hoped the theme of “A 5G Mindset For Golf’s Future” will fire up the powers that be in Asia to explore and devise a strong business model designed to attract more people to take up the game and to help golf clubs as a whole, to start reflecting on strong bottom-lines. Asia can go it alone and the time to start is NOW! There is perhaps no industry that is as disruptive as the telecommunications business. Its advances are massive and like no other industry, it impacts a global community of users with the largest penetration being in China and the rest of the Asia Pacific. To fully understand the paradigm shifts that 5G technology would herald, it will help to point out that it will bring faster, more reliable connections for users. It would also provide the extra bandwidth needed to create what’s being called the “Internet of Things” — a network that links not just phones and computers but also robots, cars, and all manner of sensor-equipped consumer products and infrastructure. 5G would even usher in a new era of “smart cities” in which energy grids, traffic signals, and emergency services are linked to reduce inefficiencies. The list of innovations is virtually endless, and it is most definitely going to have a very positive effect on how the business of golf is conducted going forward. In a word, it is all going to be good for golf and how as an industry, 5G can be harnessed by the golf industry to grow the game. While the developed world struggles to arrest a decline in the golf industry, there is tremendous potential for the growth of the game in Asia. By just looking at population and economic megatrends, there is no denying the fact that Asia has all the right ingredients to throw into the pot to stew up a healthy and promising elixir for golf’s growth. It is in this tasty brew where one can find the secrets of how Asia can grow golf and take charge of its own destiny. First off, take the combined population of three geographic regions in Asia – China, India and the Association of Southeast Asian Nations (ASEAN). Collectively, these regions account for more than 3.3 billion humans. In any language, this is a massive number. Next, break down this number by age groups with the focus falling on those under 25 years old and we are looking at a number in excess of 1 billion. The latest figures available on the size of the combined economies of the regions under review hits the revenue barometer gauge at over US$20 trillion dollars. Note that Japan, South Korea and Taiwan are not included in this review. One just can’t ignore these staggering statistics and when projected against key demographics of the population in China, India and ASEAN, close to 1 billion are in the tender 25 years and below age group. When viewed in the context of higher education, higher wages and more moving up into the middle class, the region really starts showing off its muscle. The middle class in China and India is expected to exceed 1 billion people by 2030. There is no denying the fact that the numbers speak for themselves and one cannot ignore the fact that even a tiny percentage from this huge prospect base can give golf a massive boost. The math looks good and if the golf industry comes together to start working on this potential market, the future of golf at least in Asia is very promising. Do you play golf? Only 9% of the respondents gave an affirmative answer. What is it that you do not like about golf? 91% reported that it was too expensive while a further 93% thought that golf was only for the rich. Would you consider taking up the game if it was inexpensive? The response was overwhelmingly over 95%. Note that the objective of this random survey was to get a read from the young in the region as to how they perceived golf and when analysed, it was discovered there was a high “aspiration factor” amongst this target group to give golf a try. With this knowledge, the industry must put its money where its mouth is. For decades, the golf industry has talked about making the game more affordable and more accessible and more playable. Unfortunately, this has just remained as talk with no real action being undertaken. In the context of the APGS theme, the golf industry needs to engage with technology and make the game more accessible using Smart Apps like tee-time reservation services to promote and sell hours that go unused daily throughout the region. Special discounted tariffs should be looked at to convert the unsold times and this is where affordability comes into play. Allow flexibility where new and younger golfers can play a reduced number of holes instead of having to play a full nine or eighteen holes. After all, a hole sold is a dollar earned! Another way to attract the young is for golf course owners and operators to change their business models to give access to the general public to play the game. China, India and the ASEAN countries need to seriously look at converting from membership clubs to a more pluralised operating system with the objective of promoting and growing golf. This infusion of new blood is urgently needed and, in an environment where very few public courses exist, ease of accessibility must be boldly pursued. In the case of India, around 160 courses are owned by the military. These Army-Navy-Air Force owned courses account for 60 percent of all golf courses in India. The time has come for these courses to throw open their doors to a growing middle class so that golf no longer remains a game for an exclusive few. The window to move in and grab a chunk of Asia’s growing young market is now fully open. There is most certainly an aspiration amongst the young to take up the game and with role models like China’s veteran Zhang Lianwei and young superstar Li Haotong and Indian veterans like Jeev Milka Singh and youngsters like Anirban Lahiri and Shubhankar Sharma together with Thailand’s Thongchai Jaidee and Kiradech Aphibarnrat, there has never been a better time to promote golf to the region’s burgeoning young market. The writing is on the wall and it is glaring down upon the industry. The movers and shakers in Asia must show their initiative and take a bold leap forward to change for the better and grow golf. Everything is in place and the time for ACTION is NOW. APGS 2019 is all primed to send out the key messages and it is assembling a team of some of the best speakers to deliver the need for a brand-new mindset that is purpose-designed and purpose-built for Asia. APGS 2019 will also be totally different in keeping with the bold theme which will be developed in the coming months. The dates for APGS 2019 are November 4 – 6 and this coincides with the post Diwali celebrations in the country, one of the most popular festivals of Hinduism. APGS is owned and organised by the Asia Pacific Golf Group. APGS 2019 – The 13th edition. One Of The Industry’s Best!